The lighthouse at Cape May Point, New Jersey. Click to enlarge. Hawks are migrating now and one of the best places to see them is Cape May, New Jersey. Lots of the birds flying down the Atlantic flyway get channeled into the southern tail of New Jersey and end up concentrated at Cape May Point. They often wait there for weather favorable for the flight across the Delaware Bay and on southwards. 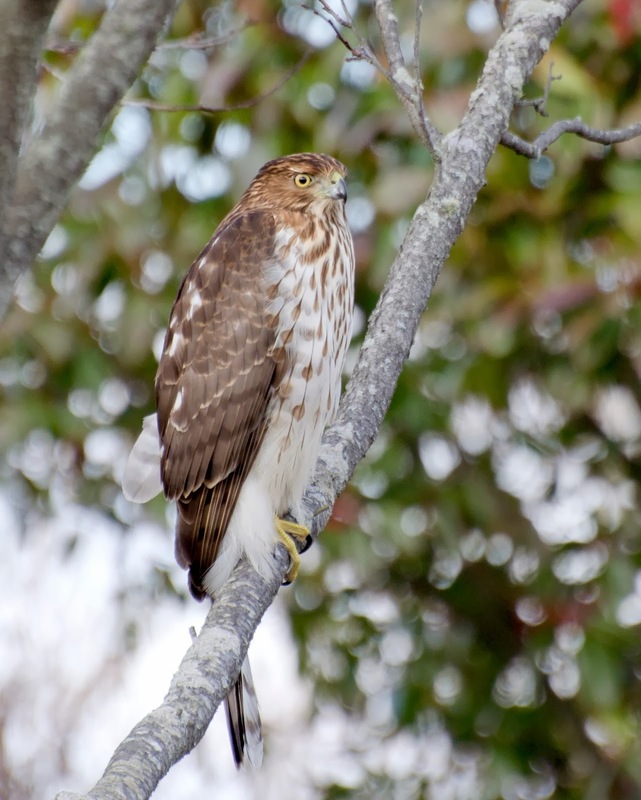 Tens of thousands of hawks fly through Cape May every year from September through November. On some late September and early October days the official count can be over 2000 birds. If you'd like help with identifying hawks overhead, there is no better place than the hawk watch platform in Cape May Point State Park where experts record every bird that flies over. There are also hawk banding demonstrations in the nearby pavilion. Click here for a link to the park's website with directions and a description of activities. Just head for the lighthouse and park in the lot. Often the overhead birds look like this, so take binoculars. But sometimes they get pretty close. And sometimes you spot one in a tree. And there are lots of songbirds migrating, too, so there is something to watch between hawks. To me the songbirds always seem a bit nervous, what with all those songbird-eating raptors around. Not only that -- monarch butterflies are migrating now and they pass through Cape May, too, sometimes in large numbers. I've seen hundreds of them gathered on the same tree there. There is an active monarch migration research program that you can read more about by clicking here. Add in a walk on the beach and some saltwater taffy... how can you resist?